I like asparagus. But it’s one of those vegetables I never really know what to do with. I always end up with it just stuck to the side of my plate with no real purpose. However, here’s a very tasty salad from Spain which is great on its own as a starter or as a side dish for the main event. 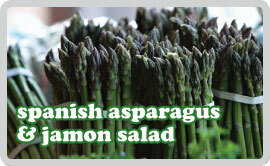 Trim, then cook the asparagus until tender. Remove from heat and cool completely. Meanwhile, in a food processor or with a hand blender – blend the pepper, tomato, vinegar, oil mustard and anchovies into a paste. When the asparagus is at room temperature wrap half the spears in 1/2 slice of ham, arrange on a plate alternating between wrapped and non wrapped, then spoon over 3 tablespoons of dressing and then sprinkle with egg, parsley, salt & pepper and a drizzle of extra virgin olive oil. If you’re vegetarian you can leave out the jamon and it’s equally as nice. As a starter on it’s own, part of a tapas menu. How versatile is that?